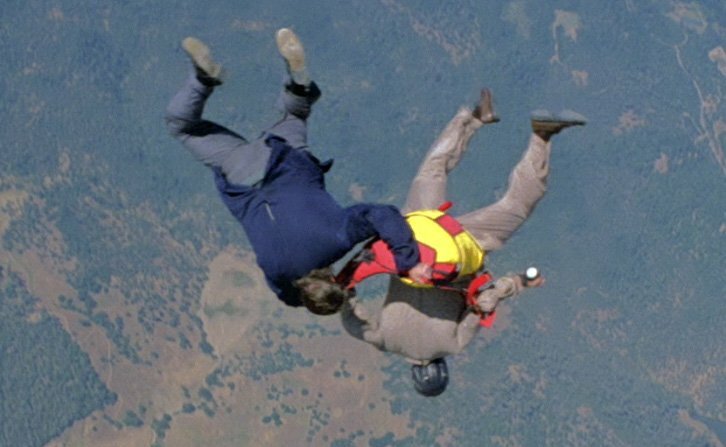 Moonraker‘s pre-title sequence involves a skydiving scene, and his skydiving stuntman (Jake Lombard) can be identified by his different clothing. For his studio shots, Roger Moore wears a marine blue wool serge double-breasted blazer with six buttons and two to fasten. Whilst traditionally any double-breasted jacket would have peaked lapels, this one has unconventional notched lapels. Since the early days of the modern double-breasted jacket, notched lapels have occasionally been seen on the double-breasted jacket, though peaked lapels have always been the standard design in modern times. The excessive width of the notched lapels here makes them unappealing, while wide peaked lapels are more tolerable. The lapels have swelled edges. The sleeves have three buttons and the back has double vents. The hip pockets are patch pockets with flaps. The blazer’s buttons are polished brass with four holes and sewn with contrasting navy thread. With the blazer, Roger Moore wears a thin beige wool jumper with a ribbed polo neck collar, ribbed cuffs and a ribbed hem. He wears the jumper untucked. The mid grey flannel trousers are cut with a wide, flared leg. 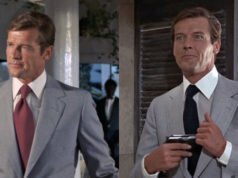 Roger Moore’s blazer has double vents and the stuntman’s blazer has a single vent. The single vent helps hide the parachute better and doesn’t flap about so much in the windy sky. However like notch lapels, a single vent on a double-breasted jacket is a faux pas. Along with the single vent, the blazer has a break-away seam down the centre back to allow the parachute to open. Roger Moore’s blazer has brass buttons with holes to sew through and the stuntman’s blazer has shanked brass buttons. Roger Moore’s blazer has three buttons on the cuffs whilst the stunkman’s blazer has only one button on the cuffs. 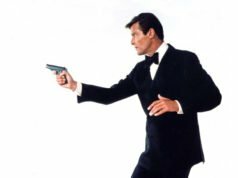 Roger Moore wears horsebit slip-ons whilst the stuntman wears lace-up four-eyelet derby shoes with an apron front, so the stuntman’s toe still looks similar to Moore’s toe. Obviously, lace-ups will stay on better when skydiving. 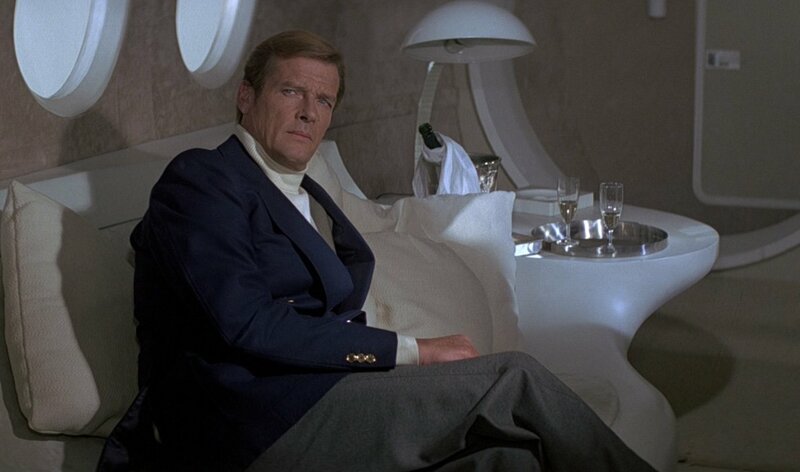 With the blazer, Roger Moore wears a thin beige wool jumper with a ribbed polo neck collar, ribbed cuffs and a ribbed hem. He wears the jumper untucked. The mid grey flannel trousers are cut with a flared leg. I like the marine blue colour of this blazer a lot. The notched lapels are unfortunate and really bring down the piece, put peaked lapels on it and it would have gone down as a classic. You see many odd jackets made in this great colour these days. I’m trying to recreate this outfit would wearing the horsebit moccasins be okay in this day in age, I should I go with a lace up? It can be difficult for a younger man to pull off horsebit moccasins. Simpler styles of moccasins may be easier to wear. You could wear a lace-up too.